She said yes. And the start of the soccer match would have to wait. 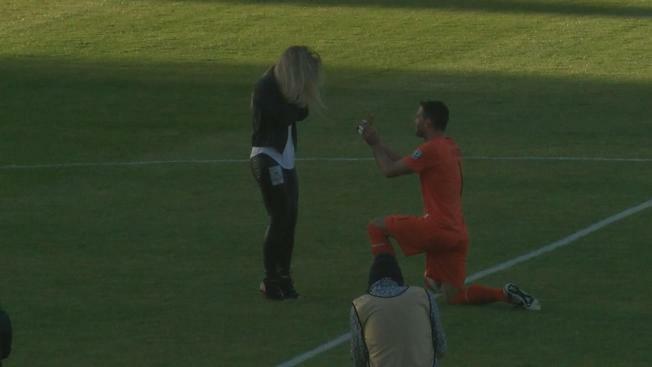 Marriage proposals at sporting events are not all that uncommon, and they typically involve fans in the stands. But what happened last weekend during a San Francisco Deltas professional soccer game at Kezar Stadium offered a new twist. Deltas goalkeeper Romuald Peiser asked his girlfriend Taylor Lincoln to come down to the field before the game Saturday night, and she had no idea what was about to happen. Lincoln recalled the scene and what was going through her mind. "So he was with the guys, and I guess he just told them, 'One sec, I'll be right back,'" Lincoln said. "And they were all, 'But we're supposed to play a game; where are you going?' And he turned and walked towards me, and that's when it all kind of fell into place." Peiser and Lincoln met two years ago when both were employed by the Ottawa Fury. A mutual love of soccer drew them together. "That's why I think it was so special," Lincoln said. "Some people think we're crazy and stuff, but we met on the field and fell in love on the field, and we spend our days and our nights on the field, so it's definitely part of who we are. So, to do something like that just made complete sense for us." Peiser said he's happy the way it turned out. "It's something you have to be proud of," he said. "I told her, like I imagined that I would drop the ring or I fall down or she passes out. That would have been bad, but I think since everything went well, it's something we can be proud of. It's a really awesome memory. "I'm pretty proud of me, of us," he added. "I think it's a really nice way to start our life together."